Posted on 12, July 2016 by EuropaWire PR Editors | This entry was posted in Education, Science, Technology, United Kingdom and tagged Her Majesty The Queen, Leverhulme Research Centre for Forensic Science, Mrs Susan Ballou, Professor Claude Roux, The University of Dundee. Bookmark the permalink. 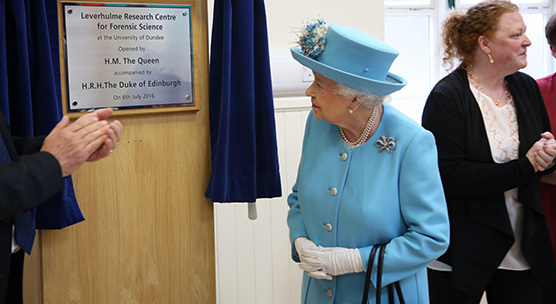 Dundee, Scotland, UK, 12-Jul-2016 — /EuropaWire/ — Her Majesty The Queen has officially opened the Leverhulme Research Centre for Forensic Science at the University of Dundee. The Queen and His Royal Highness, The Duke of Edinburgh, saw some of the world-leading forensic techniques being developed at the University, such as hands identification, innovative fingerprinting and a new generation of lifesaving smoke alarms. The Leverhulme Research Centre for Forensic Science has been established at the University with a £10million award from the Leverhulme Trust. The Leverhulme Centre builds on the University’s reputation as one of the world’s leading centres of excellence in forensic science. It is led by Professors Dame Sue Black and Niamh Nic Daéid, who led HM The Queen and the Duke of Edinburgh on a tour of the forensic laboratory. “We are delighted to welcome Her Majesty and His Royal Highness to our new Centre and to let them see how we are building a new future for forensic science,” said Professor Black. “With the valued support of the Leverhulme Trust, our ambition with this new Centre is to strengthen the science behind forensic science and develop better, more effective evidence types that can support a modern criminal justice system. To help meet that challenge, the Leverhulme Research Centre for Forensic Science at Dundee is bringing together experts from the around the world – from the other leading academic centres and from across the criminal justice system. “We are already building an international network around the new Leverhulme Centre and it is our privilege to work with key national and international partners on future research in a truly collaborative global alliance,” said Professor Nic Daeid. The University of Dundee is ranked number one in the UK for forensic science, largely based on the work of the Centre for Anatomy and Human Identification (CAHID), one of the world’s foremost institutions for the study and application of human anatomy, forensic human identification, disaster victim identification, forensic science research and forensic and medical art. The Centre was awarded the Queen’s Anniversary Prize for Higher Education in 2013. Dundee was one of four UK universities – alongside Cambridge, Liverpool and Sheffield – to win the new Leverhulme Research Centre awards. The Centres are funded for up to £10 million over 10 years, to support fundamental cross-disciplinary research across the whole range of the STEM (science, technology, engineering and maths) subjects, humanities and social sciences. The Centre for Anatomy and Human Identification (CAHID) at the University of Dundee is headed by Professor Sue Black. It is one of the world’s foremost institutions for the study and application of human anatomy, forensic human identification, disaster victim identification, forensic science research and forensic and medical art. It was awarded the Queen’s Anniversary Prize for Higher Education 2014. The Leverhulme Trust was established in 1925 under the Will of the first Viscount Leverhulme. It is one of the largest all-subject providers of research funding in the UK, distributing funds of more than £80 million every year. For further information about the schemes that the Leverhulme Trust fund visit our website at www.leverhulme.ac.uk /@LeverhulmeTrust. The University of Lausanne has a long standing tradition in forensic research (over a Century) and its PhD program in forensic science currently hosts more than 80 PhD students covering (almost) all areas of forensic research. The University of Technology, Sydney was the first university in Australia and New Zealand to develop a forensic science program and it now hosts some 30 PhD students. UTS and the University of Dundee have a special relationship through a Key Technology Partnership scheme which facilitates research interactions. The National Institute of Standards and Technology, (NIST) is a non-regulatory federal agency within the U.S. Department of Commerce. It supports forensic science through research on analytical, detection and matching methods; development of standards and data; publishing guidelines for crime laboratories, developing innovative test methods and expanding measurement science through a cooperative agreement with the Center for Statistics and Applications in Forensic Evidence (CSAFE).